David Stephensen, PT, PhD, has more than 20 years’ clinical experience managing children and adults with haemophilia. He graduated in 1990 with a degree in physiotherapy from the University of Queensland in Australia, he worked as a physiotherapist at the Royal Brisbane Hospital where he began working alongside people with haemophilia. In 1997 he moved to the United Kingdom to work at the Kent Haemophilia and Thrombosis Centre in Canterbury, where he continues to work. He also now works at the Haemophilia Centre at the Royal London Hospital and is currently a Visiting Reader in Physiotherapy at the Faculty of Health and Wellbeing, Canterbury Christ Church University. 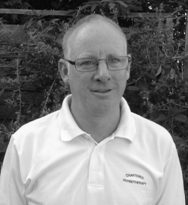 A past chairperson of the UK Haemophilia Chartered Physiotherapists Association, David is currently a member of the UK Bleeding Disorders Clinical Studies Group, Clinical Research Network for Haematology and a Scientific Committee Member of the William Scholl Podiatric Research & Development Endowment Fund. Together with Melanie Bladen and Paul McLaughlin, he has facilitated the Annual UK Haemophilia Physiotherapy Meeting, now in its 10th year, to support best practice, up to date knowledge and promote audit and research in physiotherapy and haemophilia. Dr. Stephensen completed his MSc in Physiotherapy in 2005 and doctoral research in 2010 where he explored the influence of muscle morphology and strength on walking patterns in children with haemophilia. He was awarded a prestigious 3-year National Institute of Health Research (NIHR) Clinical Lectureship for Allied Health Professionals in 2011 to explore physical performance outcomes in young children with haemophilia. He has also worked on a number of other research projects in the area of haemophilia. His main research interest is the impact of disease from laboratory to daily living on the biomechanical and neuromuscular aspects of physical performance.